This morning we headed out to Carbillo National Monument. 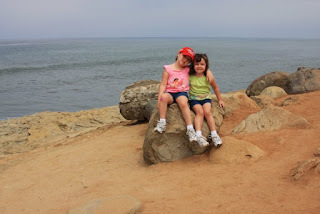 This area is dedicated to Juan Cabrillo, the first Europeaner to set foot on the Western coast. 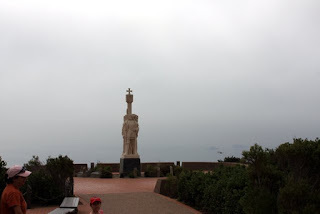 The view from atop Point Loma was great, even with the morning haze. Originally, we had planned to hike the Bayside Trail but, discovered it did not have shoreline access. 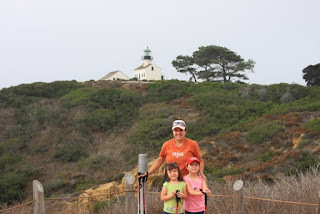 So, instead we walked to the lighthouse and then to the Whale Overlook for some photo ops. In the late winter this area is a good vantage point to view the migrating grey whales. or lack thereof, did I even go on this trip). Next, we drove down to Tide Pool area. Unfortunately, the tide was up but, we still managed to see some small ocean life. 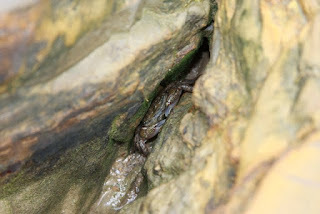 Here's a small crab hiding from me in a crevice. The shoreline here was beautiful. 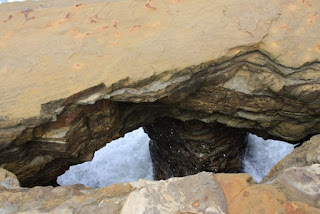 Natural rock arch up against the shore. Back at the hotel we changed into our swimming gear. 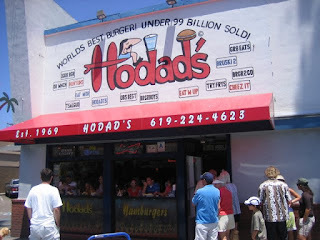 Before hitting the beach we made a stop at Hodad's. Yes, there is about a 15-20 minute wait here. This place was recently featured on the Food Network. 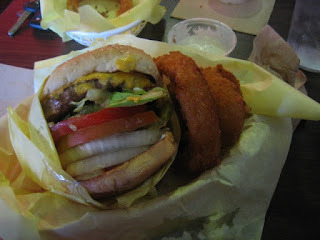 Located just a block from Ocean Beach, this is one laid back hamburger shack. The decor is wall-to-wall license plates with quirky messages. 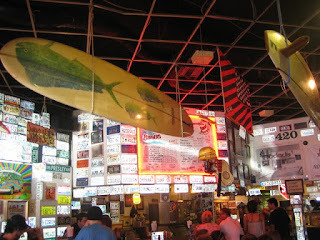 Here are some interesting observations about Hodad's: huge, community-type table in the middle of the floor, in the shape of a huge surf board; wait staff is full of body ink; loud alternative rock music playing at club level volumes; patron ages ranged from 10 to 65; and kitchen crew definitely must stay away from any of those intense, hospital magnetic-type sources due to the many piercings. About the food: the burger was good but, not as good as the hype. 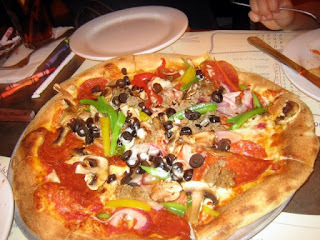 It came with a pile of vegetables, I usually prefer more meat that veggies but, I wanted to eat "it like they make it." The side were good but, I was disappointed that both the fries and onion rings were food service vs. being freshly prepared from scratch on-site. Would I go back next I am in town, probably not. Hodad's does practice menu simplicity. 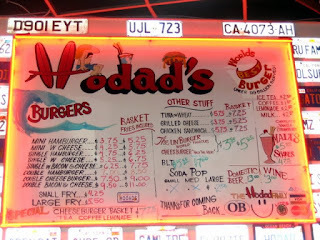 From Hodad's we headed to a spot a couple of minutes away on Ocean Beach. Leaving Hodad's going toward Ocean Beach. 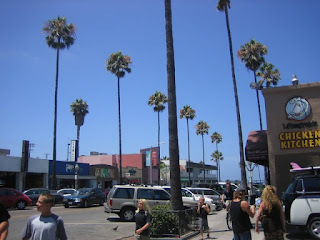 The original plan was to go to a beach in La Jolla but, Ocean Beach is much closer to our hotel (and parking was free). 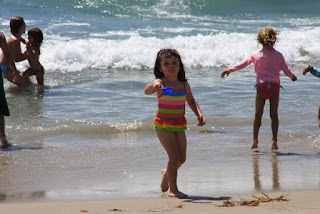 This was the first trip to a beach for the girls and they loved it. They couldn't get enough of the sand or the water (which was quite cold). 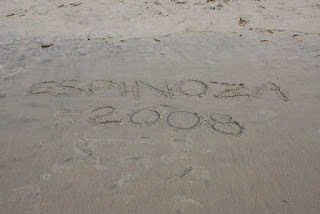 They spent their time in the water "battling" the waves and looking for shells and the, other half making sand castles. Both of the girls had spent 4 weeks of this summer on swim lessons. They are actually very accomplished swimmers for their age (at least compared to me at that age). They both like to go underwater to get dive rings. At the beach they both wanted to swim underwater....that is until some salt water splashed into their faces. This girls made several trips to the 'well' to make some wetter castle making sand. About half of the people at this beach spot had boogie boards. I will have to rent/buy one this next time...it looks too fun! Have I mentioned the weather? 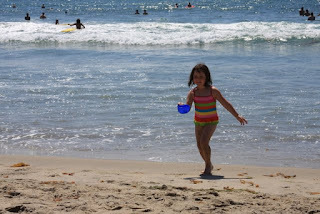 The family spent about 3 1/2 hours at the beach and no one broke a sweat. Before our wood-fired pizza arrived they served us complimentary baked, garlic dough balls that had a light coating of olive oil/rosemary. Dianna and I had the Works pizza (minus the anchioves) and the girls split a kid's cheese pizza. I suggest you hit up Pizza Nova ! We also split half of the house salad (our waitress was good about not upselling the larger portions and, she was, like, totally from Cali, OMG). This half salad was enough for both of us. It was different and really, really good. It consisted of California lettuce mix with glazed walnuts, cranberries and apples all tossed in an apple cider vinaigrette.